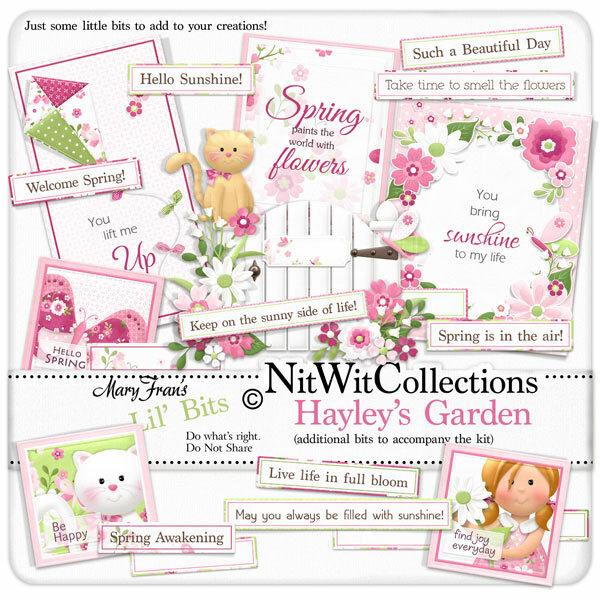 Lil' Bits "Hayley's Garden" is a don't miss element pack!!! The garden gate scene, wordart and square scenes will add such character and style to your layouts and cards that you really will not want to be without them. Don't miss out on these digital elements as they are not included in the FQB "Hayley's Garden" Collection so don't pass these by! 1 Square with a butterfly welcoming "Hello Spring"
1 Square with the white cat wishing you to "Be Happy"
1 Square with our girl sharing her thoughts to "Find Joy Everyday"
1 Word art - "You Bring Sunshine...."
1 Word art - "Spring Paints the World with Flowers"
1 Word art - "You Lift Me Up"